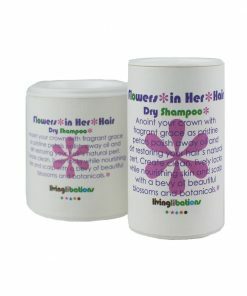 When luminous locks need a lift, Living Libations Flowers in Her Hair Dry Shampoo gives the gift of scent and grace! Forget wet hair and embrace the ease of dry shampooing from absolutely anywhere. Invite pristine petals to clean and restore your hair’s natural pert. We have woven garlands of botanicals into a dulcet dry shampoo that absorbs excess oil, dispels dry flakes, soothes the scalp, increases shine, and saves you time. There is no need for a shampoo-shower when you have the flower power of all natural minerals, botanicals, and essentials oils in the palm of your hand. Go ahead! Extend your hair style, hike that extra mile, work up a sweat, sleep in and deepen your yoga practice. 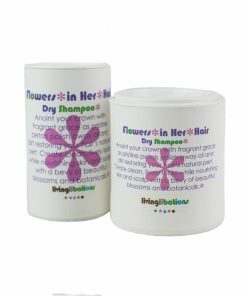 Flowers in Her Hair Dry Shampoo adds time to your day for rest and play. It is a powder-based prayer for lustrous locks everywhere! Many dry shampoos are packed with polymers, parabens, corn, rice and aluminum starches, toxic talc, and flammable isobutene, propane and alcohols that inhibit healthy hair growth, dry-out hair, attract residue and block the breathability of the scalp. 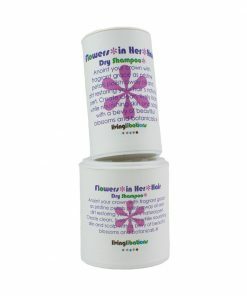 Each ingredient in Flowers in Her Hair Dry Shampoo is masterfully mixed to optimize hair health and beauty. Balancing baking soda absorbs excess oil. Kaolin clay works like a magnet to draw residue and cleans oils out. Silk peptides create a silky sheath around each hair follicle to lock in moisture and detangle strands. 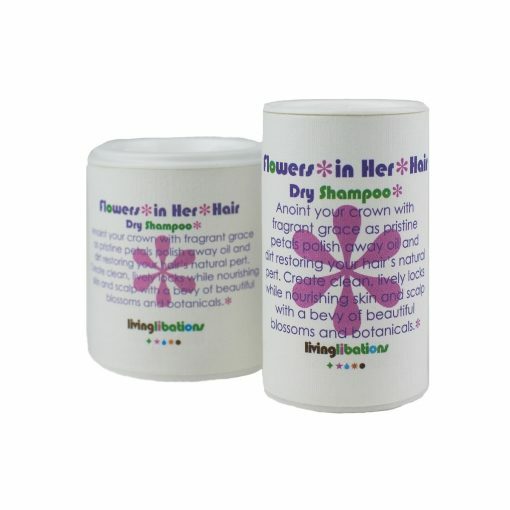 Bursting in blossoming botanicals, Flowers in Her Hair also includes a fragrant floral wreath of whole chamomile flowers, whole lavender flowers, Roman chamomile essential oil, lavender essential oil, jasmine sambac, ylang ylang, and magnolia blossom to soothe scalps, lift dry locks, and saturate strands with sweet sensuality. Arrow root powder supports absorption, while our rosemary supercritical concentrated extract naturally provides optimizing plant power. Sprinkle a dime size amount into the palm of your hand and massage it into the roots of the hair working away from the natural part. Move from roots to tips. Let the powder sit in your hair for a few minutes to absorb and activate all the nourishing plant botanicals. With a wood comb or natural bristle brush, comb through the hair to evenly distribute the shampoo and stimulate the scalp. Style your hair as usual. Use as necessary throughout the day or week. If you use too much and your hair looks powdery or clumpy, simply run wet fingertips through your hair. Maranta arundinacea (Arrow Root), Kaolinite Clay, Silk Peptides, Rosmarinus officinalis (Rosemary Extract), Sodium Bicarbonate, Probiotics, Anthemis nobilis flowers (Chamomile), Lavendula officinalis flowers (Lavender), Jasmine sambac (Jasmine), Cananga odorata (Ylang), Michelia champaca (Magnolia Blossom), Anthemis nobilis (Chamomile), Lavandula angustifolia (Lavender). Arrow Root (Maranta arundinacea) – Arrow root powder is made from the rhizomes of this tropical plant, it soaks up sweat, creates soft, smooth skin between hair follicles and silky strands. Kaolin Clay (Kaolinite) – This silica rich clay is an ancient hair and skin preparation that is used to draw out residue and impurities. It is balancing and nourishing for dry skin and helps the scalp maintain optimal oils levels while absorbing excess hair oil. Silk Peptides – Silk peptides are pure silk protein in powder form. Light-weight silk peptides form an elastic coating around every strand of hair, offering shielding and super shine. Silk peptides also boosts elasticity and detangling . Rosemary Antioxidant Extract (Rosm arinus officinalis, CO2) Extract – Rosemary extract is a natural preservative that also brims with botanical benefits for your mane. 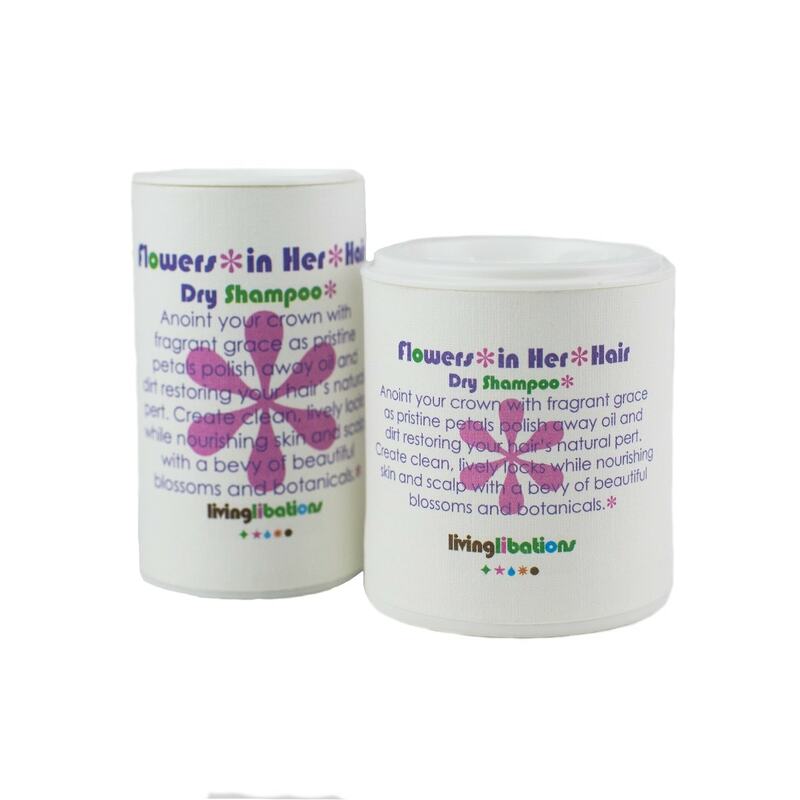 Created by special supercritical extraction, rosemary revives limp hair strands, refreshes scalp and volumizes. Baking soda (Sodium bicarbonate) – Sodium bicarbonate is a natural cleaning agent that helps remove dirt, impurities, and product build-up from the hair and scalp. It prevents hair from looking greasy by absorbing excess oil at the hair follicle and throughout the hair. (L. plantarum, B. bifidum, and B. longum) – Probiotics, when taken internally and applied topically may improve scalp dryness. This probiotic strain has a proven shelf life of two years without refrigeration, and is vegan, gluten-free, and dairy-free. Chamomile Flowers – (Anthemis nobilis) – Petals of calming chamomile flowers fragrance follicles and mop up excess moisture. Lavender Flowers (Lavendula officinalis) – These fragrant purple petals pressed into a powder anoint your hair with the calming, soothing essence of pure French lavender. Jasmine Sambac (Jasmine sambac) Essential Oil- Open your heart and head to the sultry scent of tropical twilight of jasmine flower unfurling themselves to the night. Juicy with joy, the aromatic wonders of jasmine sambac are an alluring scent that increases confidence and feelings of sensuality. Ylang (Cananga odorata) Essential Oil– Lovely Ylang is an amorous, balancing oil that supports skin in its quest for the perfect amount of moisture. Oily locks and dry scalps will both benefit equally from the harmonious impact of ylang ylang on oil levels. When the perfect amount of oil is produced on the scalp, the hair is shiny and moisturized – never greasy. Magnolia Blossom (Michelia champaca) Essential Oil – Magnolia blossoms effuse the sweet smelling gift of the Indian Magnolia Tree with its gorgeous white flower buds. Adorned in the hair by the women of India for thousands of years, Magnolia flowers, also known as White Champa, is euphoric in its aroma and emits the fragrance of femininity. Chamomile (Anthemis nobilis) Essential oil- This genus of chamomile is a balm of calm to your hair care. 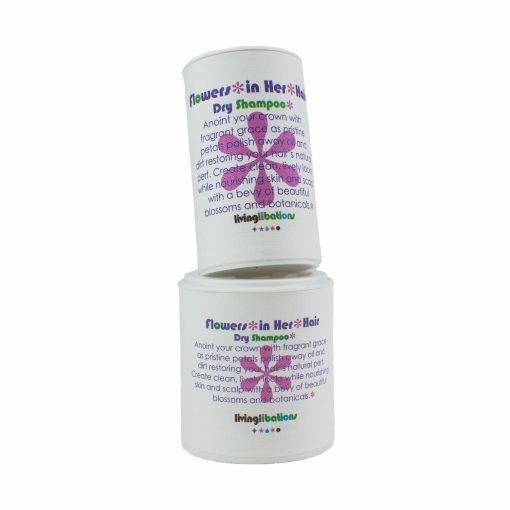 Tresses under synthetic stress and scalps suffering from dryness will relish the soothing attention of chamomile. Lavender (Lavandula angustifolia) Essential Oil – This high-altitude lavender offers a lovely lullaby to head, hair, and scalp. Relaxing and aromatic alpine lavender is an effective soother and smoother of skin, scalp, and hair. I absolutely adore this product! I try to wash my hair only once (max. twice) per week and this product really helps stretch it out even more without being full of nasty chemicals. I’ve also started just using it to make my hair smell even nicer than it does after using Living Libations shampoo and conditioner. I’m obsessed with the smell and regularly get compliments on it. ❤️Best dry shampoo i have tried!!! So beautiful ingredients and leaves my hair so clean and shiny!!! A new favorite of mine!!!??? I love it so much in between washes to refresh and revive my hair.